One day in the late 70’s a quadriplegic asked an engineer friend to modify his van so he might be able to drive it. The engineer went to work on the request and successfully converted the van so his friend could safely drive himself. The friend was so pleased at his newly found independence that he asked if it was possible to design a door opener to automatically open and close the door to his house – and the result was the first Power Access automatic door opener installed in 1978. 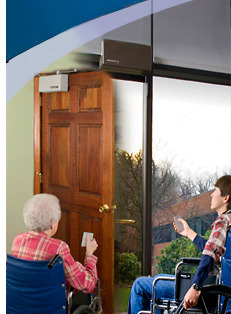 Since 1978, Power Access has concentrated on building openers and related controls to help those that need assistance through side hinged doors. To date many thousands of Power Access openers have been built and installed throughout the USA and Canada. To this date, this is still our only business. Power Access is located in Northwestern Connecticut, an area noted for the ingenuity of its metalworkers and engineers. Our assembly techniques assure top quality and dependability. We are a small company with a big dealer network. We're making it easier for people to visit Federal, state and local municipal buildings. Hundreds of schools and colleges across the country use Power Access Door Operators. Installed in homes, apartment buildings, hotels and factories, Power Access automatic door openers are on the job. While the door opener installation is usually quite simple, we do have a network of dealers who are familiar with the Power Access door opener. They can select the proper door opener for the application, install it and back it up with service if service is needed. We now have a new residential door opener - Model 2300 designed specifically for the home. This door opener is smaller, lighter, easier to install and less expensive.